Kamal Haasan's next offering after Vishwaroopam 2 would be Uthama Villain directed by Ramesh Arvind and produced by Thirrupathi Brothers. 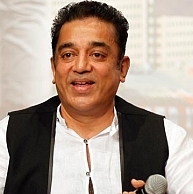 Kamal is reported to be playing an ageing superstar in the movie. We have an update regarding the technical team of Uthama Villain. Promising young composer Ghibran who happens to be one of the main crew members of Vishwaroopam 2, is set to compose for Uthama Villain as well. He has also apparently composed 4 songs for the film already. Kamal Haasan is also expected to pen lyrics for the movie, as he generally does for some of the songs in his films. Uthama Villain will be shot in full swing once Kamal is free from his commitments for Vishwaroopam 2. He recently updated that CG works are happening in full swing for this sequel to 2013's blockbuster, Vishwaroopam. Kamal Haasan, Vairamuthu And Santosh Sivan, The Shining Gems! People looking for online information on Ghibran, Kamal Haasan, Uthama Villain, Vishwaroopam 2 will find this news story useful.